Our Fabric Dining Chairs and Upholstered Accent chairs are among the most popular in the UK, all designed for style, comfort, and durability. Our ever growing fabric dining chairs ranges are extensive and have grown to be among the most popular dining chairs in the UK today. 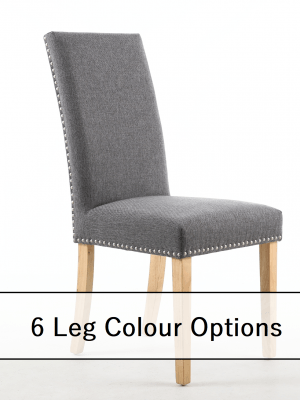 At Capital we have been designing and retailing upholstered dining chairs for over 15 years so we have developed a good eye for style and build quality. The are some great looking finishes available such as Herringbone, linen, floral, velvet, and striped. All available in a myriad of colours. We also have a free sample service in case you need to make sure the look and colour is right before make the purchase. Feel free to drop us an email at sales@capitaldiningchairs.co.uk and we can get them in the post for you 1st class. If you need any help or to Place your order, please call Free on 0800 599 9795 and one of friendly staff can help guide you to you new chairs. The Bella Grey Tweed dining chair are a very stylish upholstered dining chair designed with looks and durability in mind. The stylish Grey Tweed upholstery is very hard wearing and durable soft to touch quality Tweed weave. Hand laid metal stud work around the edges of the seating area and back rest complete the look. 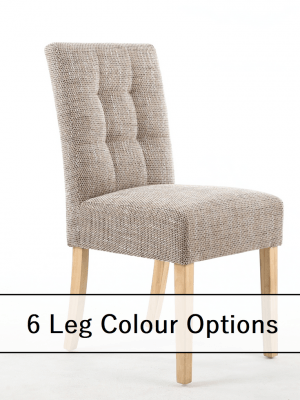 The Bella Chair is available with 3 stylish leg colour options. you can choose your leg colour below. The Bella Silver Grey fabric dining chair are a very stylish upholstered dining chair designed with looks and durability in mind. The stylish Silver Grey upholstery is very hard wearing and durable soft to touch quality Linen weave. Hand laid metal stud work around the edges of the seating area and back rest complete the look. 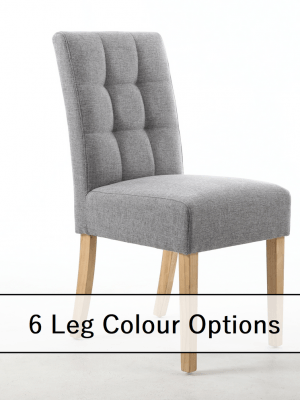 The Bella Chair is available with 6 stylish leg colour options. you can choose your leg colour below. The Bella Steel Grey fabric dining chair are a very stylish upholstered dining chair designed with looks and durability in mind. The stylish Steel Grey upholstery is very hard wearing and durable soft to touch quality Linen weave. Hand laid metal stud work around the edges of the seating area and back rest complete the look. 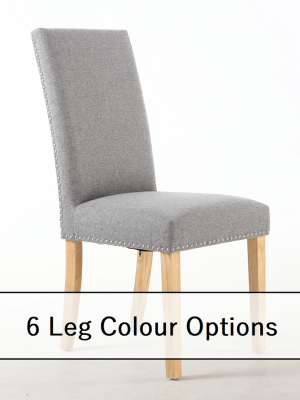 The Bella Chair is available with 6 stylish leg colour options. 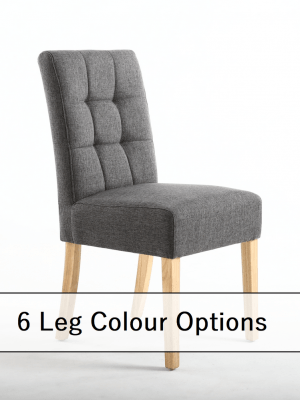 you can choose your leg colour below.